My wife and I are getting really concerned regarding the education system our kids are in. Ken Robinson summarises the main points in his TED talks, like this one. I agree with him that current schools kill creativity and do not set the conditions to let talent flourish. However is hard to change the system from scratch. Then I realised this scales up to higher degree education (e.g. PhD) where I do have the power to change things (at least for my three PhD students). During the PhD, the conditions are way better than in primary school. You learn by doing. Your effort has a clear purpose of advancing Science. You have flexibility in schedules and to some degree on topics. However, is not rare that PhD students are not highly motivated. How can we set the right conditions (i.e. motivate them) to maximise the learning experience during a PhD? This is a discussion I have no answer, but we should have. A good place to start are Uri Alon talks and papers (here and here). One thing I already talk about is the idea of self-organizing teams and adopting “agile /scrum” ideas. Frequent stand-up meetings, or encourage side-projects that reflect what you are really passionate about, are things help keeping motivation high. Another powerful idea is the concept of “flow“. 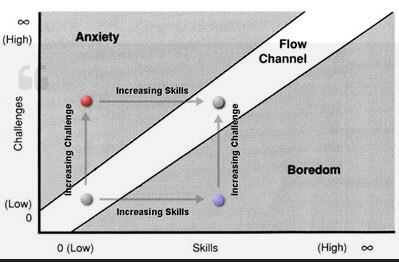 The term “flow” was created by psychologist and father of Positive Psychology, Mihaly Csikszentmihalyi and I learnt about it when I used to climb big walls. You flow when doing difficult things that you master, and its great. The following graph shows the idea. The problem is that its tricky to suggest increasing challenges to PhD students that don’t become “boring”, but do not create anxiety. However, it’s worth trying to think with them along this lines. We are practicing to ring the alarm bell early on if they get anxious, so we can work on getting the skills first. Any other things that work for you?